Unstan ware is the name used by archaeologists for a type of finely made and decorated Neolithic pottery from the 4th and 3rd millennia BC. Typical are elegant and distinctive shallow bowls with a band of grooved patterning below the rim, using a technique known as "stab-and-drag". A second version consists of undecorated, round-bottomed bowls. Some of the bowls had bits of volcanic rock included in the clay to make them stronger. After firing, bone tools were used to burnish the surfaces to make them shiny and impermeable. Jones, Andrew Meirion; Jones, Richard; Tully, Gemma; Maritan, Lara; Mukherjee, Anna; Evershed, Richard; MacSween, Ann; Richards, Colin; Towers, Card. "Prehistoric Pottery from Sites within the Bay of Firth: Stonehall, Crossiecrown, Wideford Hill, Brae of Smerquoy, Muchquoy, Ramberry and Knowes of Trotty". In Richards, Colin; Jones, Richard. 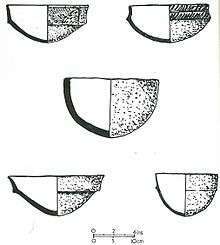 The Development of Neolithic House Societies in Orkney. Oxford: Windgather Press. p. 303 - 412. ISBN 9781909686892.